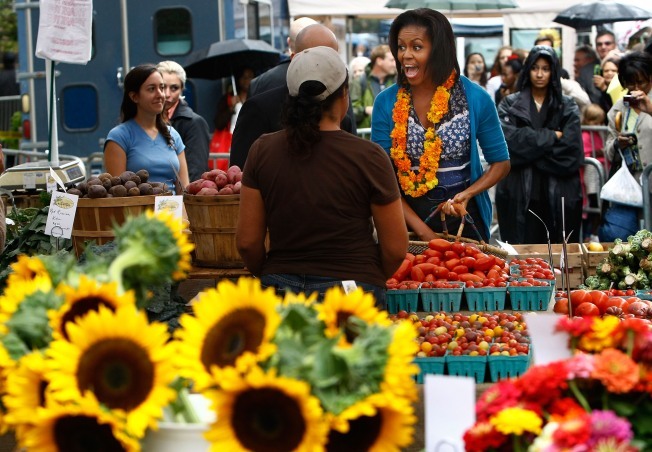 WASHINGTON -- First lady Michelle Obama bought cheese and chocolate milk at the launch of a somewhat controversial new farmers market blocks from the White House. Before shopping, Obama spoke to about 300 shoppers about the importance of healthy eating, which she said gives people the energy to get through the day. "I've learned that when my family eats fresh food, healthy food, that it really affects how we feel, how we get through the day and that's whether we're trying to get through math homework or whether there's a cabinet meeting or whether we're just walking the dog," she said. "The kind of food that we put into our body gives us the energy to get through the day." Of course, the Obamas are still susceptible to the occasional burger craving. 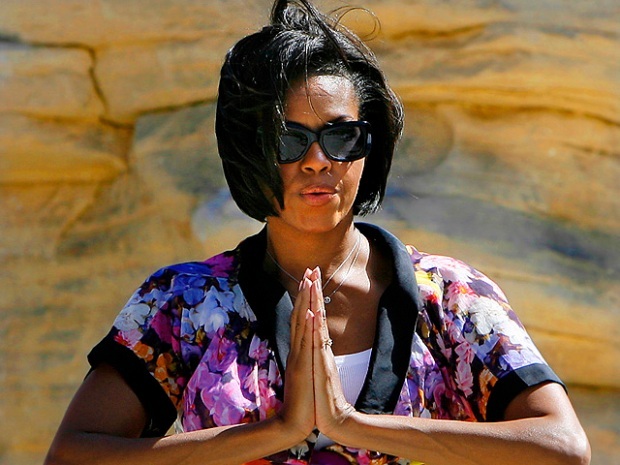 The first lady joked about the place fast food had in her family's routine. "Take out food was a primary part of our diet," she said about changing the first family's eating habits. "It was quick. It was easy. We did what was easiest and what kids like because you didn't want to hear them whining, right? We're just trying to end the whining." Obama encouraged Americans to shop where they can get to know the people who grow their food. Farmers markets are especially important in neighborhoods where access to healthy options are limited, she added. "It's a great idea as long as they don't have the metal detectors in the future," D.C. Councilman Jack Evans said. "Obviously we need them because of the first lady. But in the future I think it's a great idea to have it here, centrally located. All the people that work in these offices downtown or live downtown can come over on Thursdays and get some fresh produce." The first lady has been promoting locally grown food and healthy eating with a popular vegetable garden at the White House. Her office helped the market's organizers get a permit to shut down the somewhat busy Vermont Avenue between H and I streets in Northwest every Thursday through Oct. 29 during the afternoon rush. The farmers market will be held from 3 p.m. to 7 p.m. through Oct. 29. The block will be closed to traffic from 1 p.m. to 8 p.m.
At least one Metrobus route -- southbound L2 -- will be detoured around the market. It will operate on its regular route until it gets to H Street and Vermont Avenue, where it will turn onto 15th Street, I Street and then back onto 15th Street. It will pick up its regular route at the McPherson Square Metro Station. No stops will be missed. The organizers said the farmers market -- D.C.'s fifth -- will have 18 farmers and producers selling healthy food grown on small, local, sustainable farms in the Chesapeake Bay watershed region. That includes pasture-raised meats, artisan cheeses, milk, yogurt, fresh fruits and vegetables, breads and baked goods.